I shared some ideas in a past post on what to give the bride the morning of her wedding, but today I am focused on wedding morning gifts for the groom! Although not necessary, an unofficial gift exchange on the morning of the wedding between the bride and groom can be fun. 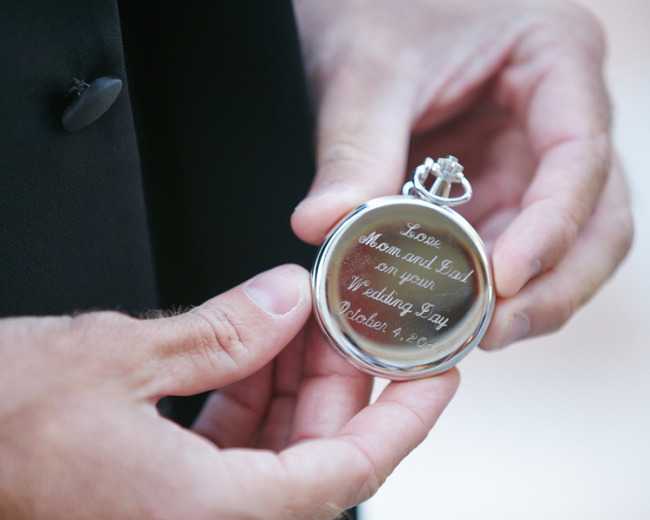 It doesn’t have to be an expensive gift – a keepsake token or something meaningful works just as well to give your groom. We see many amazing photo opportunities arise during gift opening, so make sure the photographer is around to capture the emotion of the morning. 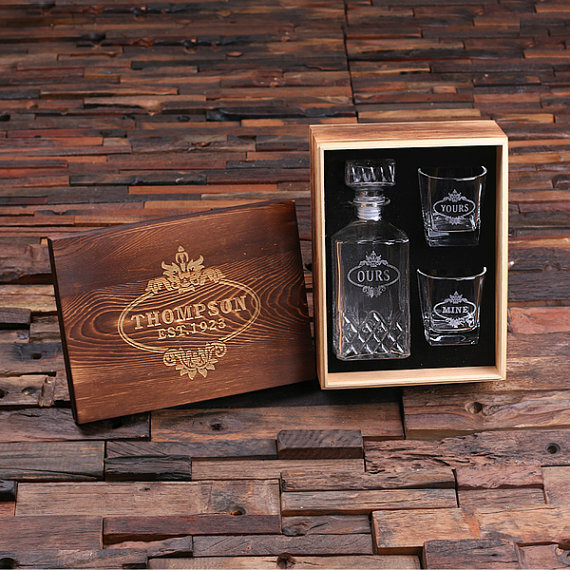 You shouldn’t have much trouble finding the right gift for your groom because there is a schwack of options online. Here’s our curated list of favorite groom gifts including tech gadgets, grooming accessories, and even food gifts. Some guys are into fragrance, others not so much. For those who are, buy a new bottle of cologne for him and the smell will always remind you both of the day you married. The art of shaving never goes out of style. 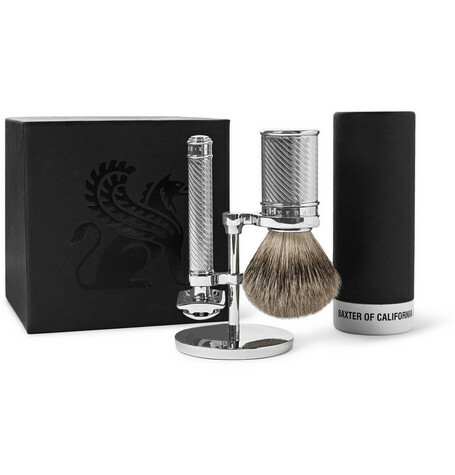 An elegantlooking shaving set with everything he needs for a close shave. After all, nobody wants to kiss a porcupine! Store the brush upside down helps ensure it dries out properly after each use and prolonging its life. In addition we love that the razor fits a Mach 3 blade — one of our favourite brands to shave with. 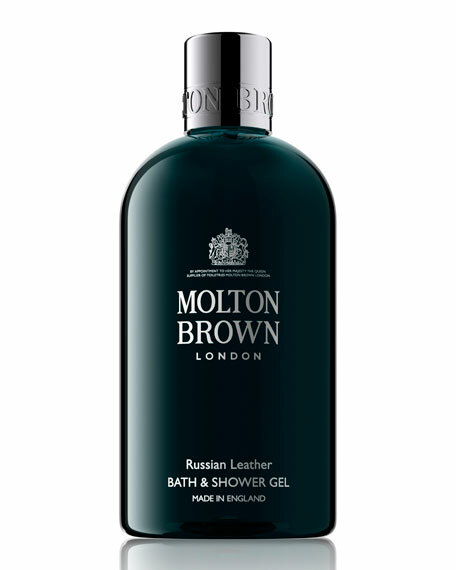 Molton Brown is synonymous with bathing luxury. Gift him a bottle of Russian Leather and he’ll be smelling as good as he looks on his big day. That aside, it is a gift that every guy needs to look his best on one of the biggest days in his life. Your mother probably told you to wear clean underwear … she likely also taught you to have neatly trimmed finger nails! 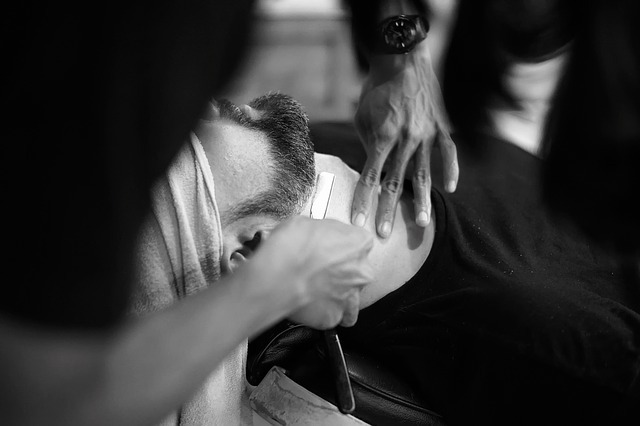 Every man should experience a good straight razor shave once in his life. If you are near his barber shop, or there is an upscale barber in the hotel, send him the morning of the wedding for a straight razor shave. 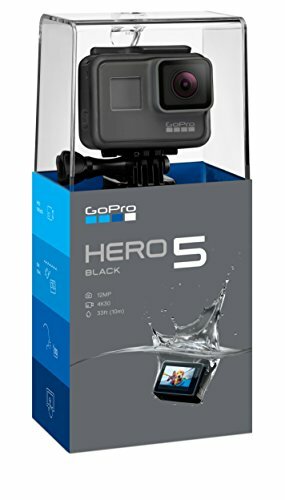 In need of a rock solid video system to capture quality action photos? Go with brand that helped to define high quality equipment at reasonable prices for the mass market. 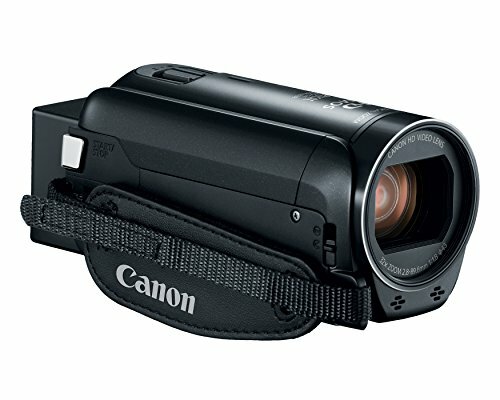 Canon is one of the best brand names when it comes to video cameras. As one professional videographer reviewer said about this particular model, “ that was easily the best $250-or-less camera investment I’ve ever made.” Reviews count, and this camera has stacked up a lot of positive ones. Go check it out. So this gift is sort of a dual gift for both him and her. 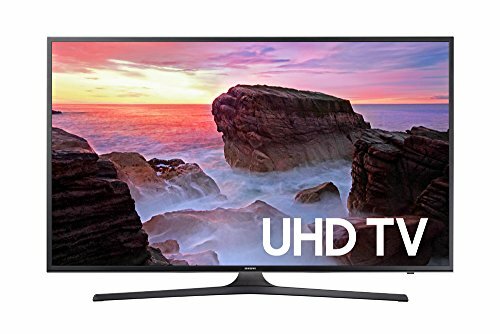 I don’t know anyone who wouldn’t loves a nice 4K Ultra HD Smart TV to snuggle up in front of with their new spouse and watch a film. Great value. If your man is anything like mine, then he is into his video games. 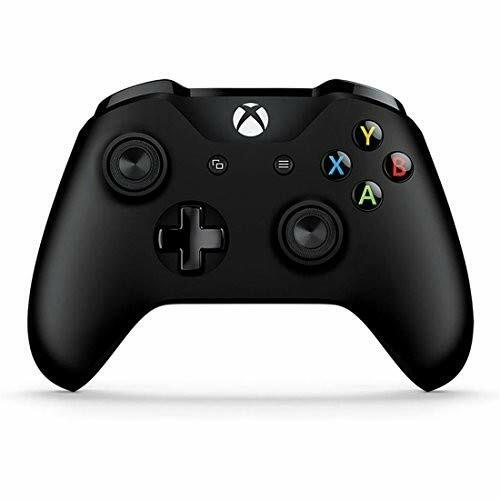 Shoot ’em up style games require the ultimate in precision and accuracy, like this wireless controller for Xbox. 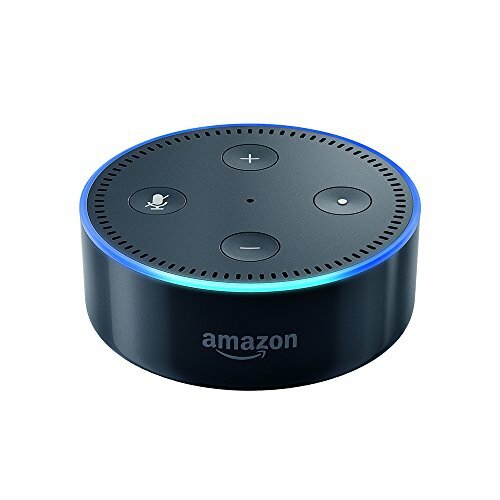 Needless to say, Alexa has taken the world by storm as one of the hottest gift items this past Christmas. If I had a crystal ball I would say the trend is only going to continue with more people buying voice activated virtual assistance devices. You probably already know if you are marrying a ‘watch guy’ or not — he’s likely got 3,4, or 10 watches on his dresser. 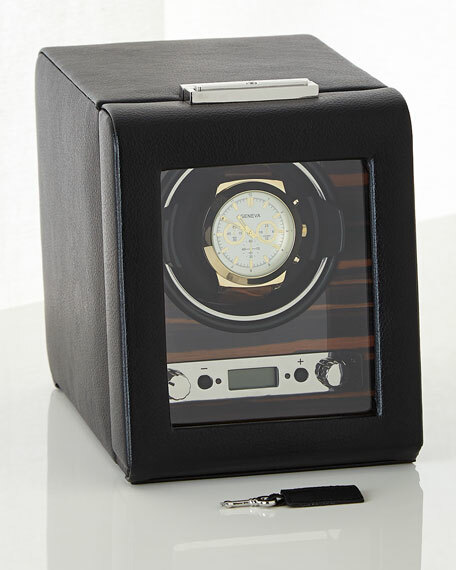 If that’s the case, this watch winder that houses up to four automatic watches is an elegant addition for a watch enthusiast. 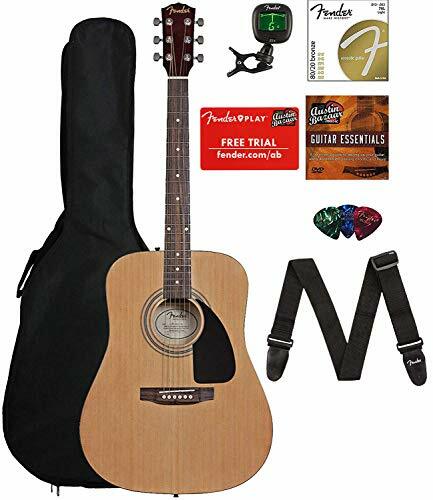 For the budding acoustic guitarist, check out this #1 best seller from Amazon. It comes with everything he needs to get started making beautiful music. Some guys have their head in the clouds and their heart set on reaching for the stars! 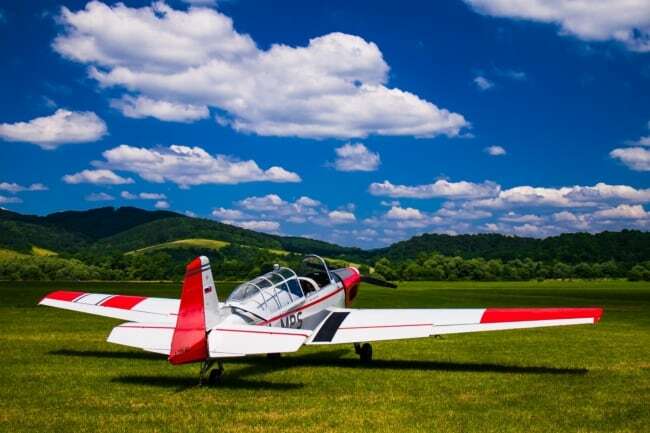 Flying lessons won’t be cheap, but may be the right idea for any aviator enthusiasts out there. 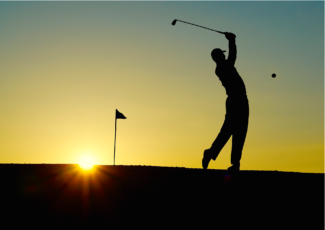 Is there a favorite (upscale) golf course nearby that he’s always wanted to try? Give him the chance by gifting a round of golf. Another idea would be to buy a round for him and three (or less) of his groomsmen at his usual course. That way, they could all spend a morning together the day before the wedding to relax, hangout, and enjoy the great outdoors. Unique idea for a gift that will last a lifetime. 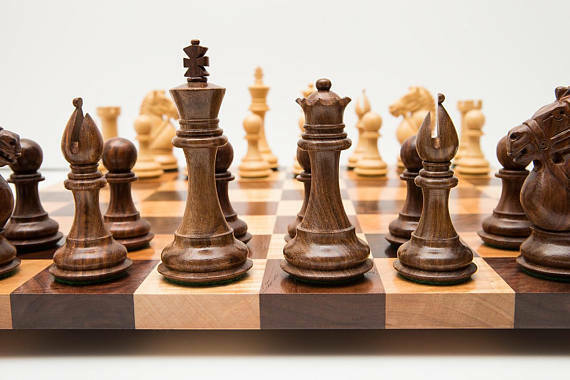 This handcrafted competition hardwood chess board set makes for a lovely gift for the groom. 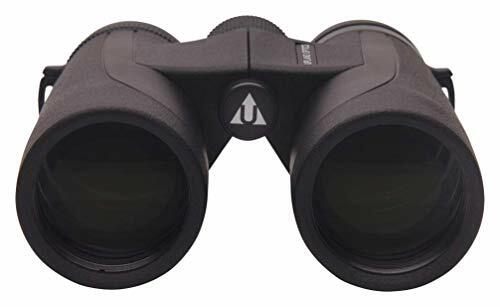 Quality binoculars last a long time and have multiple uses, not just for spying on the neighbors! Add a note that says something to the effect of ‘seeing a long happy future together’. 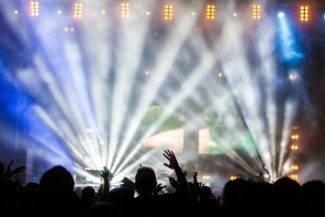 Favorite band coming to town? This is definitely high up on the list of worthy gifts for the groom. For more expensive gigs, you might only be able to buy his ticket. So just make sure to tell a few of his friends so that they can go to the show too. Of course, a date night at a more intimate venue could be the perfect gift for both of you, especially to get rid of any remaining post wedding stress! 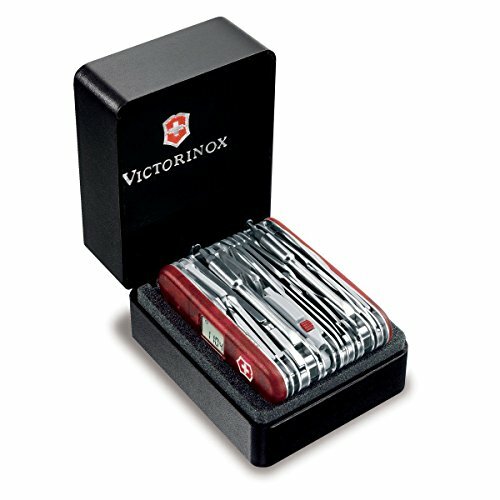 If you hubby-to-be is the outdoor type, a functional gift like a fancy Swiss army knife or other handy tool will make a great present. As Canadian as maple syrup and bacon, eh! 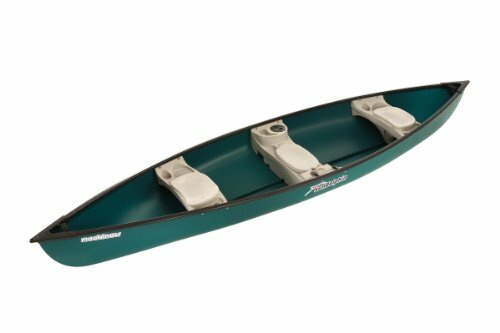 You won’t be able to easily hide this gift, unless you have a massive garage that he doesn’t use much (or a friend who is willing to store a canoe for a little while!). Another option to is this smaller kit as a mini gift. Contains wet towelette, breath freshener, dental floss, among other things. Cigars seem to be a symbolic right of passage in our society. Even if he doesn’t smoke, he’ll likely make an exception for both his wedding day, or the birth of his child. 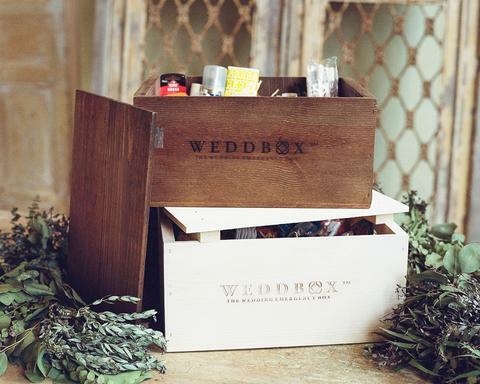 For the cigar aficionado, what better occasion to buy a box than for his wedding day? 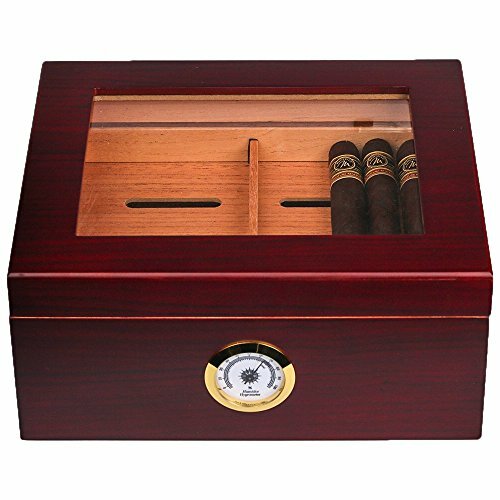 A humidor filled with a celebratory gift that he can use after the reception with all his groomsmen. Some guys are really into expensive pens. 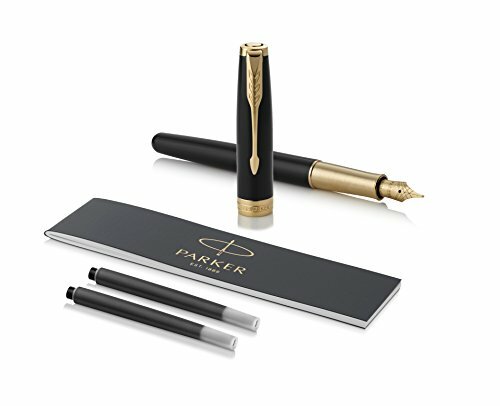 Buy a special keepsake pen as a gift for your groom on his wedding day … and then also use it during the signing portion of your wedding ceremony! 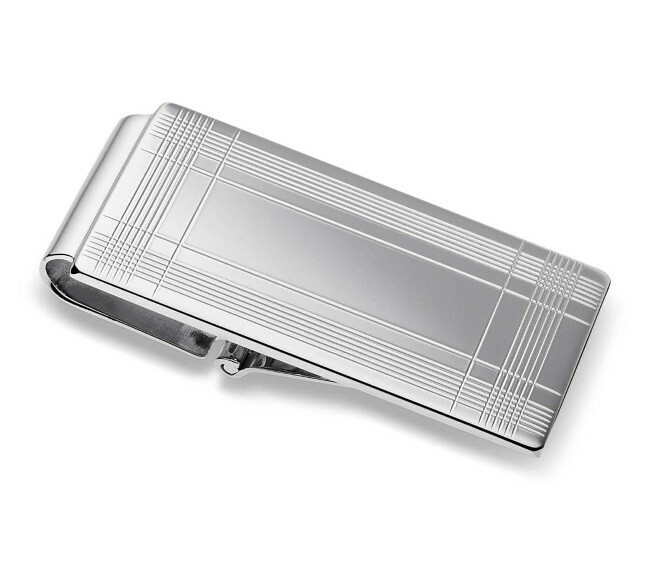 Have his initials engraved on the side of a stainless steel flask. Optional, fill it with the tasty beverage that suits him best. 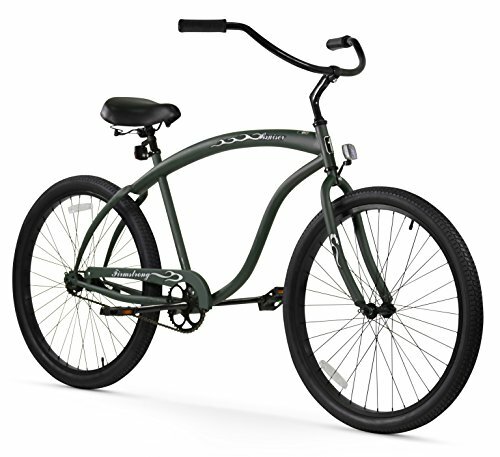 This one seems to be on many gift lists for the groom. It’s one of those elegant gifts he can use for years to come. In fact, he could unwrap it and use it the morning of his wedding as we’ve seen photos on the blog of more than one groom do. 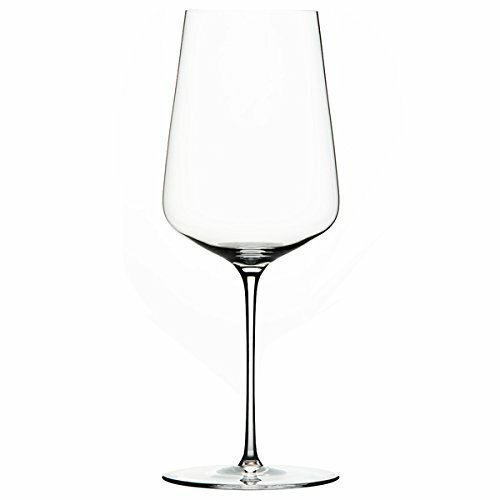 Named Wire Cutters top high-end all-purpose wine glass, Zalto Denk’Art Universal Glass promises luxury stemware for all your wine tasting adventure. We’re all lucky to be able to access so many talented artists online these days. 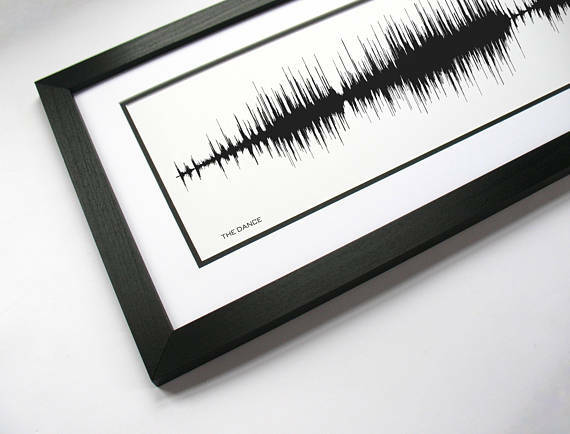 Commission something special and bespoke like this framed wedding song art. It makes a beautiful keepsake tribute from the wedding (while not explicitly screaming wedding), and it is a lovely piece for your new home. Affordable limited edition wall art for your home. Minted has e-gift certificates available, so he can browse with you and pick out one of his favs after the wedding. We love Minted for their stationery selection, and now you can get great artwork for your home too. Probably the ultimate gift for beer lovers! 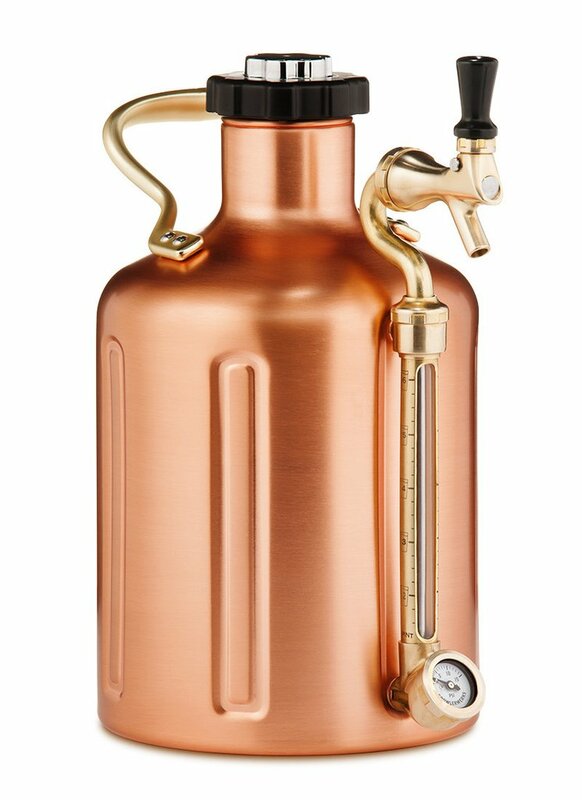 We love the look of this bad boy, with copper plate, dispenser tap, and a pressure gauge. Be warned, gift this to him on the morning of your wedding at your own risk! A craftsman is only as good as his tools. The same can be said for those culinary skill seekers in the kitchen. If he fancies himself a gourmet cook, he’ll need a well made chef’s knife. 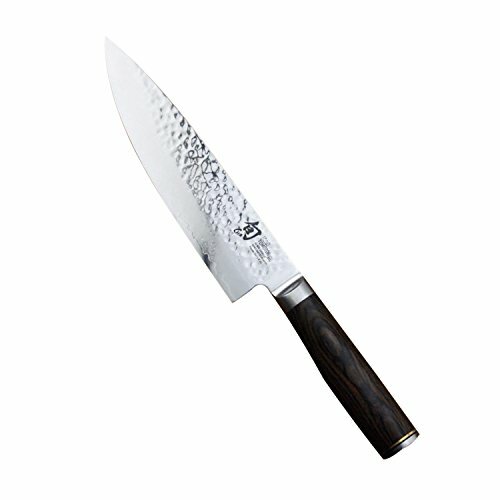 Shun brand knife can chop, slice, and dice with the best of them. 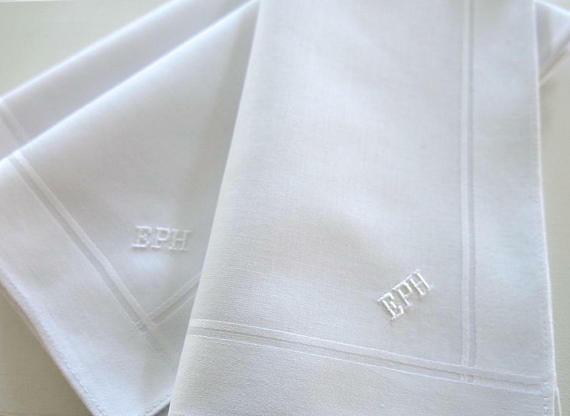 Add these personalized cufflinks to his french cuff shirt the morning of the wedding. Guys love looking their best too, and nothing says suave like cufflinks and a french cuff shirt! 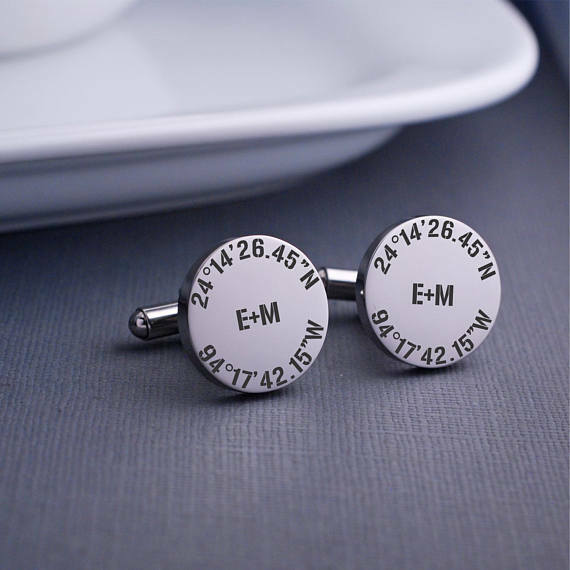 A unique idea from the cufflinks below is to engrave with the coordinates of your wedding ceremony. Heading to tropical sandy white beaches the day after the wedding? 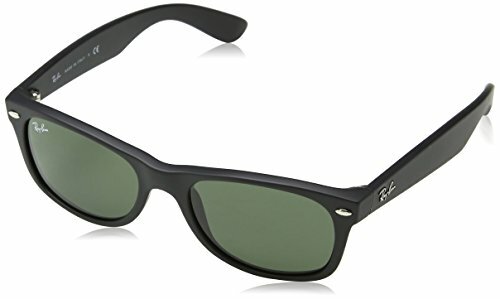 Gift him a pair of new designer sun glasses. They’ll look good and protect his eyes for a long time to come — unless he is anything like me and accidentally breaks them! 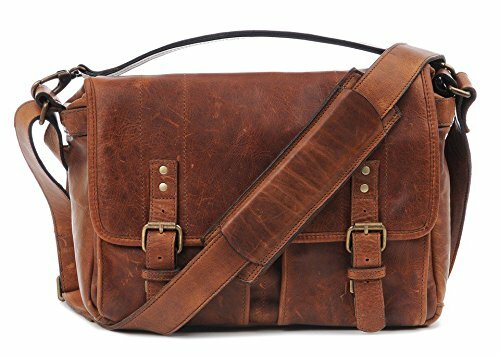 We just love the look of this leather camera messenger bag. Sure, it’s made especially for cameras and gear so grooms that are photography buffs will love it. 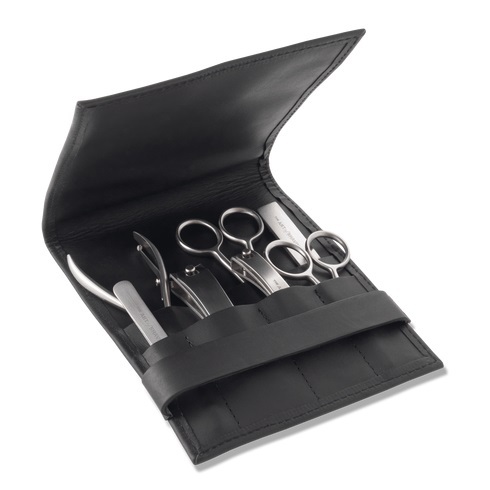 However, we think it can be handy as a carry-all for other items too. Antique cognac leather. ‘Nuff said. Handmade in Florence, Italy with full grain calfskin leather, the timeless appeal of a duffel bag will bring a smile to his face the morning of the wedding — even before walking down the aisle. 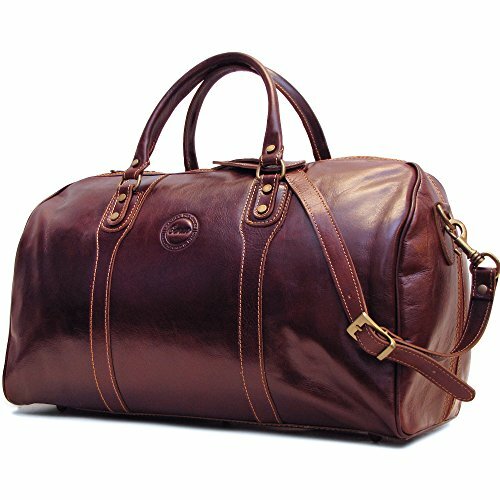 Every guy should have a nice leather duffel bag, and this one has the bravado to match many looks. 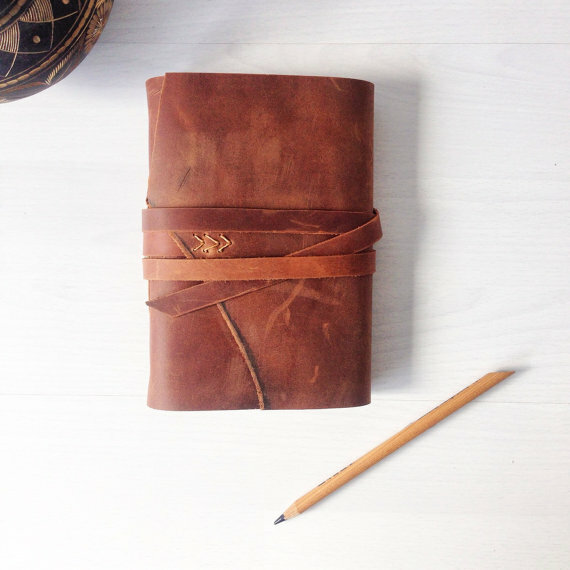 Continuing our leather gift trend, writers or those who appreciate quality leather bound goods will love to get a gift such as a journal. Etsy sellers like this one have lots of different options at price points that won’t break the bank. Go check them out. A reasonably priced gift that can be used for years — would be so much better if that stack of $100 bills came with the money clip! 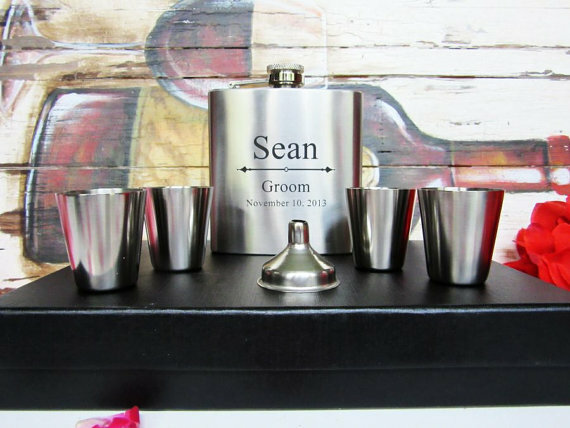 Cute and functional gift for the groom. 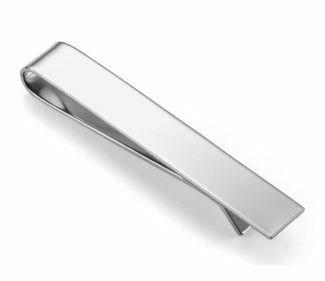 Comes in stainless steel, copper, or brass with personalized monogram. 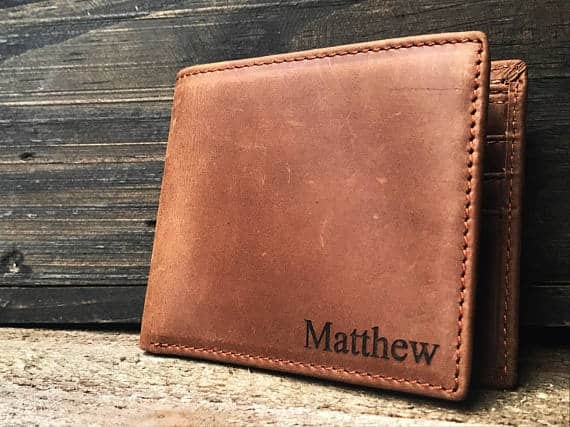 Every man loves getting a new wallet – it forms part of his identity. Years later, when the wallet has become worn with time and meets its inevitable end, he will be sad to let it go. Chin up though, a new leather wallet makes for another good gift at the third anniversary! Watches are a staple accessory that every man should own. My husband is a bit of an amateur watch guy. He only owns four at this point, but would definitely buy more if he could! And what better occasion than his wedding day to receive such a lovely gift from his bride-to-be. There are so many different styles and quality of watches on the marketplace, which means there is also a huge range of prices. Know your budget up front. Also, make sure that you choose a style he feels comfortable wearing. If need be, make sure the online store you buy from has a good return or exchange policy. For those who have bigger budgets…..
Chrono24 endeavors to bring trust to the watch market. A truly global retailer, they have sales offices in New York, Hong Kong, as well as an editorial office in Berlin. 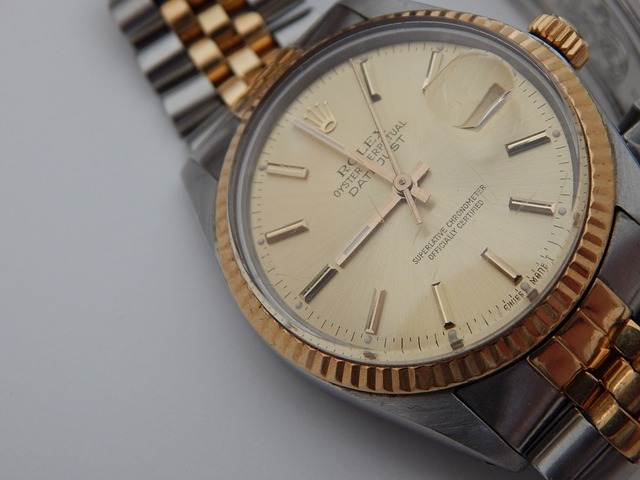 And while Chrono24 doesn’t necessarily specialize in vintage watches, just by virtue of being so big they have a really impressive selection to choose from. Pocket watches fell out of mainstream fashion sometime around the turn of the 20th century! 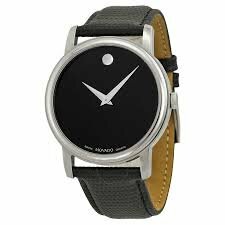 They gave way to the more popular wrist watch. 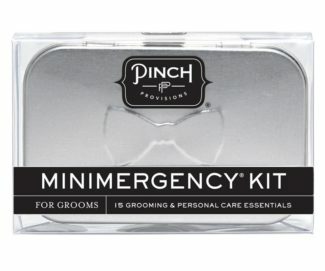 Yet, they remain as a great gift option for grooms on their wedding day. He’ll have his pocket watch with hiim for special events as it will always remind him of the best day of his life. 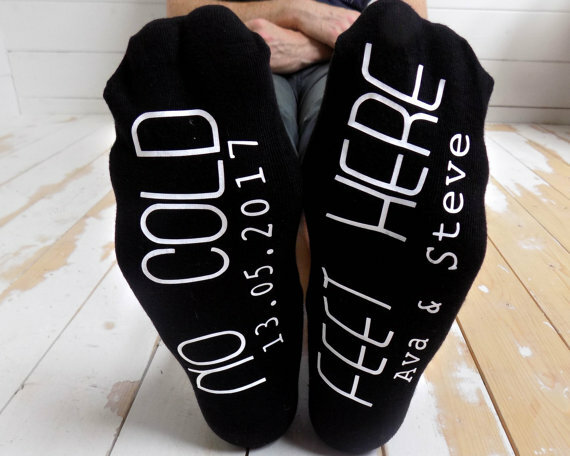 Don’t get “cold feet”. There are lots of options when it comes to socks for the groom and his groomsmen. Buying socks for him is just a fun little momento, and one that he can use after the wedding day too. Probably the best gift your sweetheart could receive is a hand written note. Nothing beats knowing that your partner sat down and took time to think about what you mean to them. A hand written love note is a romantic, priceless gesture and something they will cherish for many years to come. Price: costs next to nothing! However, you could splurge and buy some really nice handmade paper if you want. What man wouldn’t want a beautiful album staring his future wife in a bridal boudoir photo shoot? If you’re comfortable with the idea of a boudoir shoot, consider this option as a gift for your groom-to-be and use Shutterfly to create your own beautiful album. 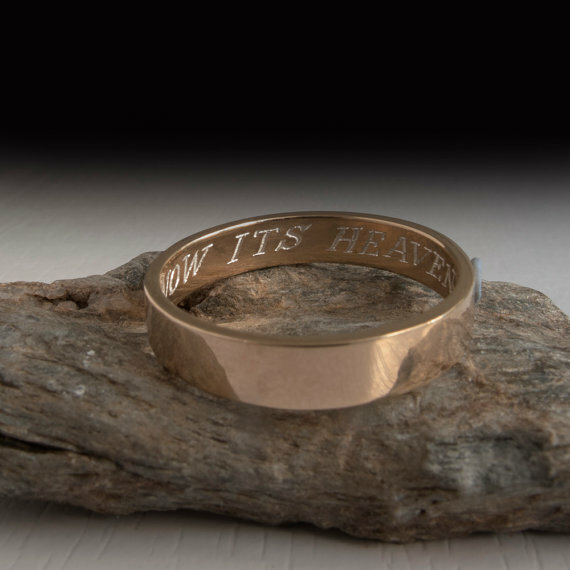 Engraving your groom’s wedding band is such a meaningful idea. 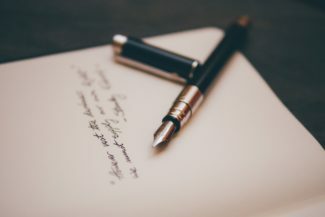 Make sure any message you write is short, as there isn’t much room on the inside of a ring. Add your initials, wedding date, or even an inside joke that will make him laugh — I added all three to my husband’s ring! Keep it on the down-low so that he has a nice surprise to read after the wedding ceremony. I think this is a fun idea. Leave him a note in the morning saying there is a surprise waiting for him on the dance floor later that evening. You could add more to the note — but I will leave the rest to your (newlywed) imagination. 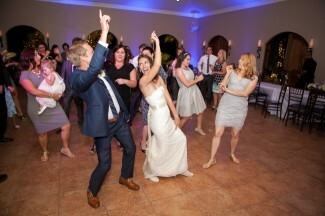 Choose music that you both love, and get your bridesmaids and groomsmen in on the action. Blow his newly bought socks off with your planned/choreographed dance moves! Talk about the next viral video! 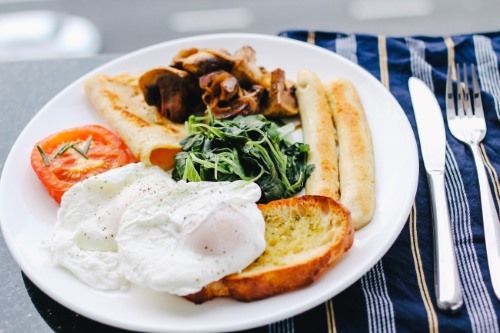 Believe me when I say, “you may forget to eat once all the festivities get going.” That’s why it is super important to start the day out right with a full stomach. Often the groom and his guys will may be nursing hangovers from the night before, which we highly recommend against! You’re paying for a huge wedding party and should enjoy every moment of your day. A nice gift is to have breakfast delivered as room service if staying in a hotel, or to arrange for breakfast delivery to wherever your groom is located on the morning of the wedding. Slip in a bottle of champagne and some OJ (if you’re feeling fancy), and get a proper brunch-style breakfast into the guys. Your wedding day is all about being stylish and confident — a fancy breakfast will put you in the right mood for the entire day! If the guys don’t eat a proper breakfast, then next best thing is to get food like nuts into them. 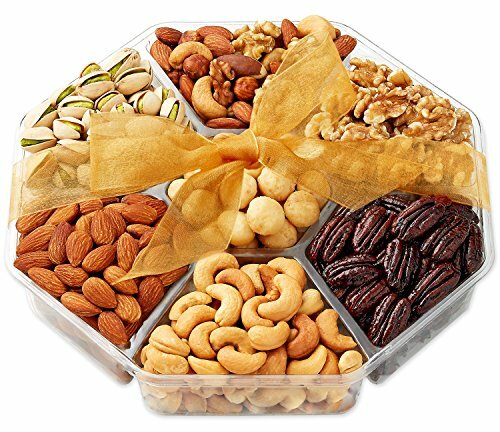 This 2 lb nut gift basket will give them that bit of energy to start the day out right. We’ve gotta throw in some yummy looking treats for the boys! 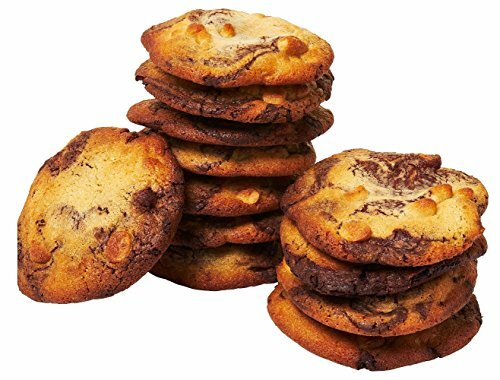 After all, who doesn’t like a good cookie? It’s his wedding day and he should get a bit of a sugar rush before the main event starts. Alright, there you have it. I know there are many more wedding morning gifts that we could include, but I will have to stop here. Would love to hear back from you, let me know in the comment section what you plan on buying for your groom!